Caribou have large, concave hoofs that spread widely to support the animal in snow and soft tundra. The feet also function as paddles when caribou swim. Caribou are the only member of the deer family (Cervidae) in which both sexes grow antlers. Antlers of adult bulls are large and massive; those of adult cows are much shorter and are usually more slender and irregular. In late fall, caribou are clove-brown with a white neck, rump, and feet and often have a white flank stripe. The hair of newborn calves ranges from dark, chocolate brown to reddish brown. Newborn calves weigh an average of 13 pounds (6 kg) and grow very quickly. They may double their weight in 10-15 days. Weights of adult bulls average 350-400 pounds (159-182 kg). However, weights of 700 pounds (318 kg) have been recorded. Mature females average 175-225 pounds (80-120 kg). Caribou in northern and southwestern Alaska are generally smaller than caribou in the Interior and in southern parts of the state. In Europe, caribou are called reindeer, but in Alaska and Canada only the semi-domesticated form is called reindeer. All caribou and reindeer throughout the world are considered to be the same species, but there are 7 subspecies: barrenground (Rangifer tarandus granti), Svalbard (R.t platyrhynchus), European (R.t. tarandus), Finnish forest reindeer (R.t. fennicus), Greenland (R.t. groenlandicus), woodland (R.t. caribou) and Peary (R.t. pearyi). Alaska has predominantly the barren-ground subspecies and one small herd of woodland caribou, the Chisana herd, which moves into Canada in the Wrangell-St. Elias area of Southcentral Alaska. Canada has three subspecies, the Peary, woodland and barren-ground. Like most herd animals, the caribou must keep moving to find adequate food. Large herds often migrate long distances (up to 400 miles/640 km) between summer and winter ranges. Smaller herds may not migrate at all. 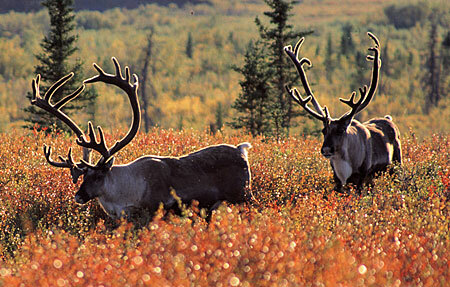 In summer (May-September), caribou eat the leaves of willows, sedges, flowering tundra plants, and mushrooms. They switch to lichens (reindeer moss), dried sedges (grasslike plants), and small shrubs (like blueberry) in September. Regarding the audio sample under the "Listen" tab: The 'huffs' are a cow; in the background you can hear a calf calling as well. Cows and calves are most vocal during calving and early summer because it's a primary means of maintaining contact. Cow/calf vocalizations diminish in frequency and length as calves mature. The only time bulls vocalize is during rut — bulls are less guttural and more 'airy' than cows. Life history events for caribou occur in different seasons, but identifying those seasons varies between herds and caribou biologists. Calving occurs in mid-late May in Interior Alaska and in early June in northern and southwestern Alaska. If females are in very good condition they can breed when they are 16 months old, but in most herds they do not breed until they are 28 months old. Most adult cows are pregnant every year and give birth to one calf — twins are very rare. In some areas, wolves, grizzly bears, and golden eagles kill large numbers of newborn calves. Caribou “swamp” predators – the cows in a herd give birth to a lot of calves in a very short period of time, essentially overwhelming predators in the area with an overabundance of food. Predators and scavengers are also quick to target stillborn or unhealthy calves. After calving, caribou collect in large “post-calving aggregations” to avoid predators and escape mosquitoes and warble flies. These large groups of caribou stay together in the high mountains and along seacoasts where wind and cool temperatures protect them from summer heat and insects. For the Western Arctic Herd, Alaska’s largest caribou herd, the post-calving aggregation is different than the summer aggregation. During post-calving, at least for this herd, bulls and nonmaternal caribou are still segregated from cows with neonates (newborn calves). Then in summer (which is also called the insect season) cows and calves gather with bulls and nonmaternal caribou to form the large aggregations. After insect numbers decline in August, caribou scatter out and feed heavily on willow leaves and mushrooms to regain body weight. The shedding of velvet (the fur covering on antlers) in late August and early September by large bulls marks the approach of the rutting (breeding) season and the start of fall migration. Mature bulls frequently have more than three inches of fat on the back and rump, which is used to provide energy needed during the rut. The necks of adult bull caribou swell enormously in September due to the natural production of steroid hormones like testosterone. Fighting begins in early September and becomes more frequent as the rut approaches at the end of the month. For the Western Arctic Herd, bulls spar during September but actual rut, marked by serious fighting and breeding, occurs during mid to late October. Rut must occur during September for more southerly herds based on their calving dates. Most fights between bulls are brief bouts, but violent fights occur, and many bulls are seriously injured or killed during the rut. Many injured or exhausted bulls are killed by wolves and bears after the rut. Unlike many other members of the deer family, bull caribou do not control a harem of cows. Instead, they control a space around themselves, and prevent other bulls from breeding females within their space. The largest bulls shed their antlers in late October, but small bulls and non-pregnant cows do not shed their antlers until April. Pregnant females usually retain their antlers until calves are born in late May or early June. In Alaska, caribou prefer treeless tundra and mountains during all seasons, but many herds winter in the boreal forest (taiga). 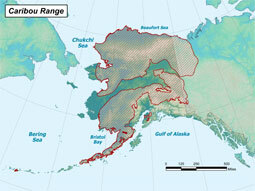 Calving areas are usually located in mountains or on open, coastal tundra. Caribou tend to calve in the same general areas year after year, but migration routes used for many years may suddenly be abandoned in favor of movements to new areas with more food. Changing movements can create problems for the Native people in Alaska and Canada who depend upon caribou for food. Caribou movements are probably triggered by changing weather conditions, such as the onset of cold weather or snowstorms. Once they decide to migrate, caribou can travel up to 50 miles a day. Caribou apparently have a built in compass, like migratory birds, and can travel through areas that are unfamiliar to them to reach their calving grounds. 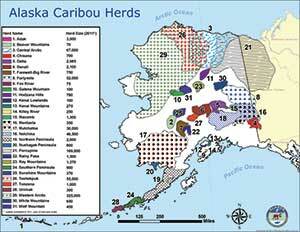 To see herd ranges in greater detail, see the map of the 32 caribou herds in Alaska. These animated maps show the movement of caribou herds over the course of a year. The map labeled North American Herds shows four Alaska herds and eight Canadian herds. 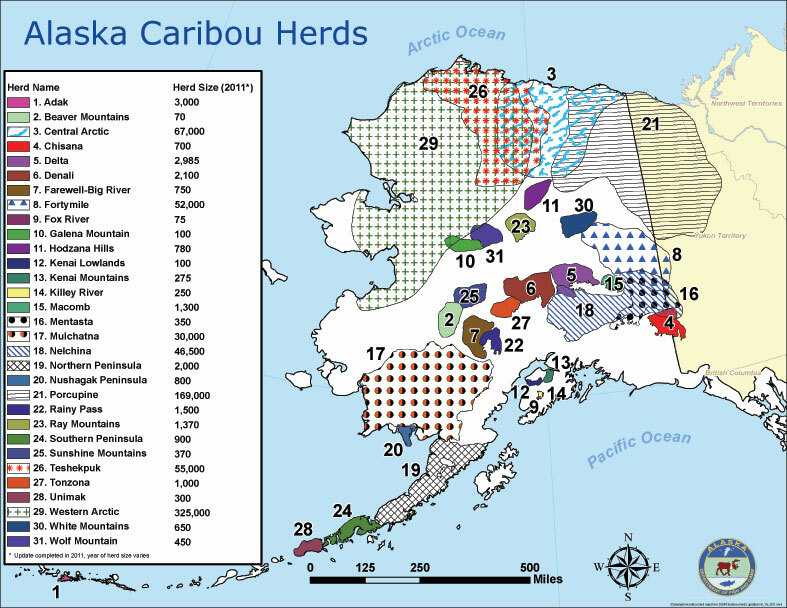 The map labeled Alaska Caribou Herds shows the four northernmost herds (Teshekpuk, Western Arctic, Central Arctic and Porcupine) of the 31 caribou total herds in Alaska. The Porcupine herd ranges into western Canada. Note that the caribou bunch up or aggregate in June on the calving grounds. Caribou herds are counted shortly after these aggregations begin to occur, typically in early July. Data were collected from about 1990–2006. This project was done by CARMA — CircumArctic Rangifer Monitoring and Assessment Network. The Network is an international group of scientists, managers and community people who have a common interest in caribou. There are approximately 750,000 wild caribou in Alaska (including some herds that are shared by Alaska and Canada's Yukon Territory). The largest herds (as of 2011) are the Western Arctic Herd at about 325,000, the Porcupine Caribou Herd at about 169,000, the Central Arctic Herd at 67,000, the Fortymile Herd at 52,000 and the Teshekpuk Herd at about 55,000. Caribou are somewhat cyclic in number, and the timing of declines and increases, and the size to which herds grow is not very predictable. Although overhunting caused some herds to remain low in the past, today, varying weather patterns (climate), population density, predation by wolves and grizzly bears, and disease outbreaks determine whether most herds increase or decrease. Adult bulls average 350-400 pounds (159-182 kg). Mature females average 175-225 pounds (80-120 kg). Caribou live in the arctic tundra, mountain tundra, and northern forests of North America, Russia, and Scandinavia. The world population is about 5 million. Caribou in Alaska are distributed in 32 herds (or populations). A herd uses a calving area that is separate from the calving areas of other herds, but different herds may mix together on winter ranges. Domesticated and semi-domesticated caribou are called reindeer.